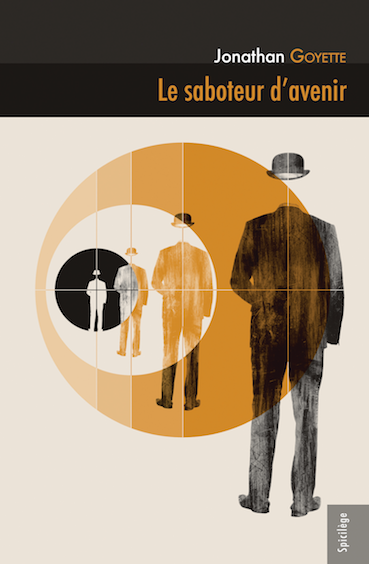 “Le saboteur d’avenir” is typical of Jonathan Goyette’s eponymous début story collection: a clever, critical look at contemporary life, by turns sinister and all too famliar. I was meeting a client at the Little Eleatic, a seedy bar where I used to hang out. Roger, the barman, had let me run a tab in the past. He must have remembered me since he said my name when I went in. I said hi and went over to my client. Right from the start of the meeting I had a strange feeling. An odd closeness to the man next to me, even though this was the first time we had talked. I put it down to occupational bias. With all my clients being so similar, I’d come up with a vision of the human soul that my companion fit to a T. This familiarity was probably nothing more than the effect of my job and being overworked. Something like déjà-vu, let’s call it. The man was edgy, trying to justify himself. “He thinks the future belongs to him,” he emphasized, as if his own particular case were unique. Someone else’s ego and the demands it placed on my client had led him to look into my services. But I never ask people to tell me why they need my expertise. That way pointless remorse won’t stop me from getting my job done. After all, nobody gets in touch with me for respectable reasons—my clients are all obsessed with ambition. I’m a saboteur of futures. As a job, it’s kind of like being a hitman, except without the bodies. The two “programs” share the same prerequisites: compulsory units in philosophy and psychology for sounding the depths of the human soul, since contrary to popular opinion both careers are grounded in metaphysics. It’s the subsequent optional units that differ. Hitmen learn how to dispose of dead bodies; we leave our victims to dispose of themselves. Since they can’t return to the origin of their existential failure, they give themselves the benefit of the doubt, although “malefit” of the doubt would be a better description of the circumstances into which I throw my victims. I’ve heard this kind of compliment so many times I rarely pay attention. All I needed to apply myself fully to the job at hand were the who, the where and the when. As for the how, I play it by ear. That’s what they pay me for. And the why, as I’ve said, is of no interest to me. I was preoccupied by the memories this stranger’s face had conjured up. Where had I met this man before? I could have asked him, but I didn’t want to offend him by admitting I couldn’t remember. He was irritated by my lack of attention. Fair enough—I myself would be insulted by far less. He slammed, rather than put, his hand on the table. Our beer glasses clinked. Ordinarily I have to drag the information I need to do the job properly out of my clients, bit by bit. This time it was the opposite; it was as if he knew the procedure better than I did. He handed me two scraps of paper that I immediately put into the outside pocket of my coat. Then he slid an envelope containing the first half of my fee along the booth’s bench, and was gone. “Roger, who on this planet doesn’t have to compromise? My responses must have annoyed him because he went back to his business without a word. I ran all the way home but the downpour still soaked me. Once inside I dried myself off and went to bed, but I couldn’t get to sleep. My mission this time was fairly straightforward. It reminded me of another case I’d dealt with. The victim was just about to be fired. I crept into his bedroom the night before an important meeting. The man was asleep, and all I had to do was move the little button on his alarm clock to “off” to screw his life up completely. Considering what I had to do, I was handsomely compensated—rather like the job lined up for the next day. But this time it wasn’t the victim that intrigued me and kept me awake, it was the client. I got up and poured myself a whisky before going to the bookshelf to leaf through some books from my training days. Perhaps a psychologist or philosopher could help me figure out this mysterious client. I leafed through a few pages of Parmenides. But then a combination of alcohol fumes and reading-induced drowsiness got the better of my resolve. I drifted into sleep without pinning down what was bothering me. I got up at dawn to be on form for when my victim woke up. I had no plan; I would improvise as always. I put on my coat and got ready to leave. That was when everything went sideways. In my daze the evening before, I’d forgotten to take the photo and address out of my jacket. Rain had soaked into the papers, rendering them indecipherable. But when I looked at them closely I made an astonishing discovery. The reason I couldn’t make out the photo, or the address on the paper, was because they had never been there. Surely there’d been a mistake. I needed to find my client and explain to him that I couldn’t carry out the job without this minimal information. The barman seemed surprised to see me standing outside the door of his dive. “I’ve been waiting for you all morning, Roger,” I complained. I described my client to him but it didn’t ring any bells. I followed him into the bar to look around. I spent the afternoon, the evening, and the next few days waiting for my client to reappear. How could he not have noticed his error the night we met? And why hadn’t he come back to find me right away? After several days spent waiting at Roger’s bar, I had to pocket the fee and move on to something else. If the mission wasn’t going to succeed, ultimately it was my client’s problem. Why didn’t he check how things had gone, making sure he hadn’t paid me to do nothing? I counted the hours with every glass of neat whisky I put back. Like my desire to understand, which had now become an obsession, the more I tried to quench my thirst the more it increased. The mysterious client’s fee dripped away on all the whiskies I ordered. And then, one afternoon, I wanted another Ballantine’s. I went to the cash machine behind the pool tables. The only paper the machine spat out was a list of recent transactions. Going back to the bar, I asked Roger for a drink anyway. Roger poured and then went about his business. I sipped my drink and fiddled with the receipt from the cash machine. How could I have emptied my bank account? I started to check the transactions on the list. When I saw that there was only one transaction, time stood still for a moment. I looked up, astonished. The mirror behind the bar returned a reflection through the bottles of alcohol. Then I started to laugh uncontrollably. Roger came up looking worried, suspecting perhaps the onset of delirium tremens. “Do you know what the Eleatics taught?” I asked. I asked Roger to pour me another. He gave me another lecture. Nonetheless, he poured me the drink I’d asked for. Every time I tried to describe my client to Roger, the only memory I could call to mind was as vague as that of my own face when I recall the past. And earlier, as I walked back from the cash machine, it wasn’t my own reflection I’d seen in the mirror but that of an old man who knew more than I did about my future. This man had been in my line of sight ever since I’d met my client. And—who knows—perhaps for a long time before that. Roger rubbed a hand on his forehead. He seemed annoyed.